The Lunar New Year holiday is a 15 day long celebration celebrated by Asian cultures throughout the world. Before the New Year arrives, Taiwanese people spend a lot of time preparing for the celebrations to come. These preparations usually include cleaning the house from top to bottom and putting up decorations. Snacks, fireworks, fire crackers, sparklers and all sorts of food needs to be bought well beforehand to avoid the crowds of shoppers. Red envelopes (紅包) or "lucky money" are also prepared as gifts for all the children in the family. Lunar New Year's Eve ( 除夕) is the time when the family gets together for a traditional feast and reunion - The feast varies between cultures and regions and the dishes you will find prepared really depends on the family you are celebrating with. In the area of Taiwan where I live a large majority of people are of the Hakka (客家) ethnic minority. Hakkanese food tends to be a bit saltier and has a bit more flavour than typical regional dishes from China. The Hakka-style feast usually consists of several varieties of pork, some fish, braised chicken and vegetables - all of which have different meanings dealing with health and money but ultimately escape me as I’m too busy eating as much as I can shovel into my mouth to really notice. I wasn't really a fan of eating pork before coming to Taiwan (probably because we’re just not that good at preparing it the way people here do) but Hakka pork dishes certainly turned me to the "pork-side" of the force. These dishes such as salty pork (鹹豬肉), braised pork knuckles (豬腳), Dongpo pork (東坡肉) and Braised pork with preserved vegetables (梅干扣肉) are all amazing and even when I was a vegetarian I'd have a hard time turning down a few bites of these amazing dishes. Its common to find a few of these dishes at a Hakka family's new year feast, so I'm always happy if I'm invited to join in the celebration. After the dinner, the fireworks come out and the kids go outside to play with firecrackers and sparklers. Lunar New Year tends to be a noisy time of the year and people set off fireworks at all hours of the day. It's probably the only time of the year when this kind of noise is both allowed and tolerated at the same time. Personally, all these fireworks stress my dog and I out, so if I'm celebrating the holiday with friends, I tend to stay inside when they come out. It's probably also not a good idea to give a Canadian boy like myself some fireworks when I've been drinking. I'd likely burn the place down or blow myself up. When everyone is finished playing, people come in, eat fruit, a variety of nuts and different types of sweets and exchange red envelopes and offer New Years wishes. After the envelopes are passed out, people will either start getting ready to go home or if you are hanging out with a fun family, they start gambling and drinking or maybe even singing karaoke. There are quite a few games that families play - I've never learned how to play Mahjong, but I have learned a few other games like the card game "Big Two" (大老二) and the really fun dice game "Xibala" (擲骰子) where you have fun gambling and never really care whether you win or lose. Yesterday was the first day of the New Year (初一) and is another busy day spent with family. 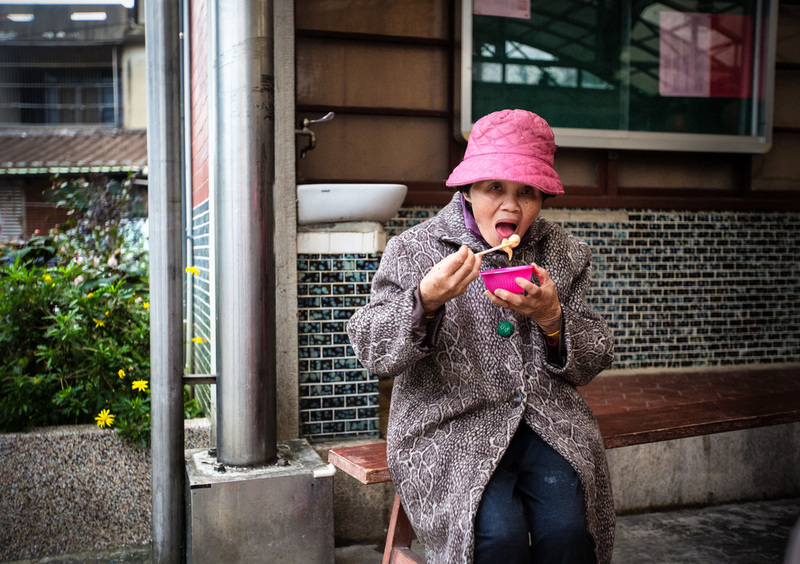 Families in Taiwan typically wake up in the early hours of the morning to perform certain religious rituals known as “bai-bai.” (拜拜) and visits temples. I decided to get up really early, grab my camera bag and made my way to some temples to get some shots - usually on the first day of the Lunar New Year I'm too hungover to take part, but this year I decided not to drink! Temples at this time are busy as almost every family in Taiwan will visit at least one. This year I visited two smaller temples near home and visited the “Mecca” for Hakka people in Taiwan: “Yi Ming Temple” (義民廟) which is dedicated to Hakka heroes who are hailed as patriots for giving their lives defending Taiwan from a revolt during the Qing dynasty. Yi Min Temple was busy yesterday filled with thousands of people making offerings to the gods, eating some dishes provided by the temple and trying their luck with the lottery (which is also a popular activity during the Lunar New Year.) The temple was loud, jam-packed with people and full of activity. Everyone seemed to be in really good cheer and having fun. 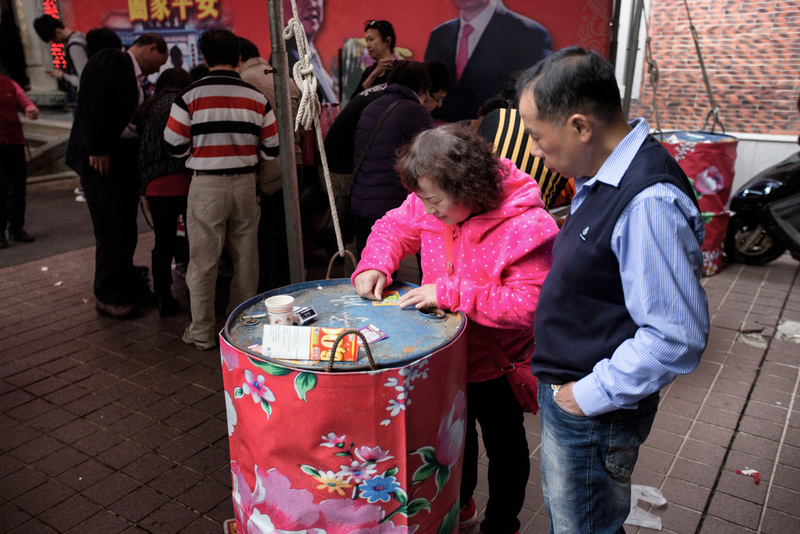 When Taiwanese people visit temples during Lunar New Year, they usually buy tools for worship at little shops near the temple which include incense sticks, ghost money and some kind of food offering. After lighting the incense they will make their way to a shrine and raise the sticks to their heads and introduce themselves to the God afterwards making a request for good health for themselves and their family as well as a little prosperity if the god sees fit. Once they finish speaking to the god they bow several times and thank him, her or it and move on to other shrines. When they finish with all the shrines in the temple (usually there are several) they will leave a food offering on a table in front of the temple which is offered to the god as thanks. Every temple in Taiwan is a bit different, so each family tends to visit the same temple every year as a matter of familiarity. The “bai bai” culture is engrained in almost every person in the country whether or not they believe in the religions or not - so while a lot of the population may actually be agnostic - most will still practice these rituals as a matter of respect for their culture and traditions. When people are finished with the religious stuff, they have the option of waiting in line and being fed by people who volunteer at the temple. Its just my guess, but from the long lines I saw yesterday at Yimin Temple, they likely fed several thousand people. Trying their luck with scratch tickets! There are others like myself though who would rather not wait in line, so they buy something to eat at one of the many vendors around the temple and they will also try their Lunar New Year luck with lottery tickets and scratch tickets. There are usually long lines to buy the tickets as well but it seems like it is important to try their luck - so the lines in the case are likely much more tolerable. After a long day of waking up early, visiting a few temples and having lunch with the family it is usually time to go back home and rest. There are still a few more days of the vacation left and there is still lots to do! The second day of the Lunar New Year (初二) is when wives typically go back to their home for a reunion with their families which involves more eating! For me though, it just so happens to be my dogs third birthday - I'm planning on spending a relaxing day with him and then heading down south in the next day or so for some more Lunar New Year temple festivities in central Taiwan. Hopefully the weather stays nice so that I can also get in a good hike before going back to work! I hope everyone in Taiwan is having a great New Year vacation. I'll be posting more in a few days.